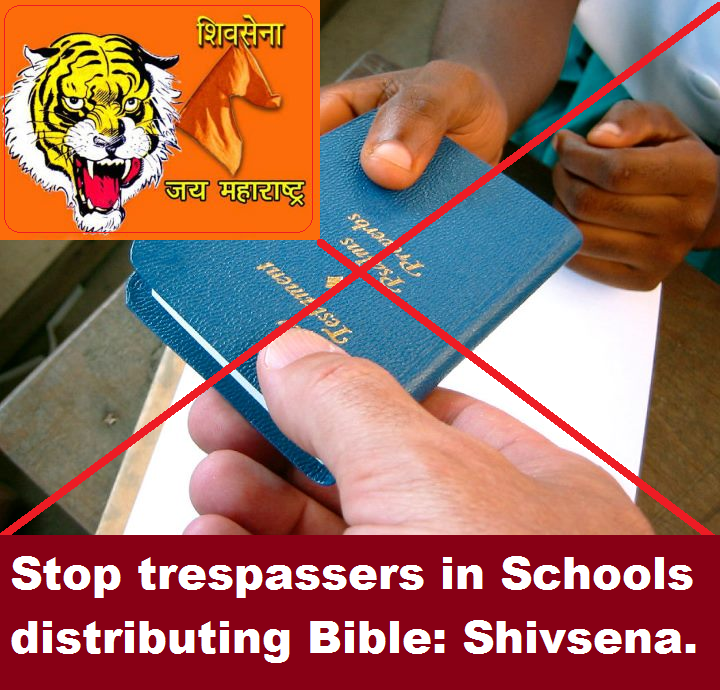 Shivsena foiled the secret plan of Christian Missionaries to convert through distributing ‘New Testament’ in college premises in a Maharashtra Town. HJS Media | Miraj | December 22, 2017:: Shivsena office bearers stopped Christians distributing the Bible in a college here three days ago. They also scolded the principal and founder of the college. Seeing the aggressive attitude of the Shivsainiks the priest (Father) had to apologise. 1. Mr. Anand Rajput from here has his son, Mast. Shivraj studying in this college. Mast. Shivraj noticed some Christians distributing Bible copies in the afternoon. He called his father on a mobile phone and informed him about it. 3. By then Mr. Chandrakant Maigure, Miraj, City-chief, Mr. Kiran Rajput, Mr. Gajanan More, Mr. Atul Rasal, Mr. Dilip Naik, Mr. Sandip Shinde, Mr. Sudhir Avasare of Shivatirth Utsav Samiti and many other Shivsainiks had gathered there. When they asked the Father about it, he tried to brush it aside saying, ‘We are not converting, but giving the information about Christmas’. Finally he had to apologise to the devout Hindus looking to the aggressive attitude of the Shivsainiks. 4. Shivsainiks confiscated large number of Bibles that time. 5. Mr. Anand Rajput said, “I had heard about such incidents being happening on behalf of Christians. Such incidents are taking place in other school premises too. The said college to give permission to distribute Bible is a very serious matter. We are going to make a written complaint in this regard to the District Collector and Education-in-charge. This college is known for its anti-Hindu activities. 6. After the guidance by Shivsainiks many students threw away the Bibles, some torn them. Hindu organisations have asked to be vigilant about not allowing such incidents to happen in other college premises in Miraj. Such incidents are on the rise at Christmas time. Such incidents are being noticed in Sangli, Kupwad cities since last few years. Some years ago Shivsena branch in Kupwad had driven away Christian missionaries from there. This entry was posted on December 22, 2017 by hinduexistence in Anti-Hindu, Attack on Hindu Sentiments, Breaking India by Christian, Christian Aggression in India, Christian Conversion Conspiracy, Christian Conversion Conspiracy against Hindus, Conspiracy against Hindus, Stop Christian Conversion Menace in India, Stop Christian menace in India, STOP CONVERSION CONSPIRACY IN INDIA and tagged distributing ‘New Testament’ in college premises, Shivsainiks confiscated Bibles, Shivsena - Miraj Unit, Stop trespassers in Schools and Colleges distributing Bible: Shivsena, students threw away Bible.